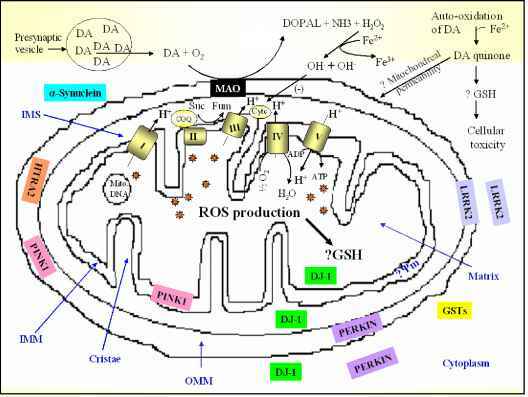 The maximum response produced by the agonist will be dependent upon the number of receptors inactivated and the amount of spare receptors present in the tissue. Lower concentrations of irreversible antagonist may decrease the number of receptors in the tissue, but the number of receptors may still be in excess and allow the agonist to produce the same maximal response as before the antagonist. Thus, although there are fewer receptors, the maximum response to the agonist remains the same as that without the antagonist. However, under these conditions, there may be a shift of the concentration-response curve to the right without changing the maximal response and the curve may resemble that produced by a competitive antagonist. At higher concentrations of irreversible antagonist, the number of receptors available for activation may be insufficient to produce a maximal response, agonist response is reduced [Figure 6]. Figure 6. 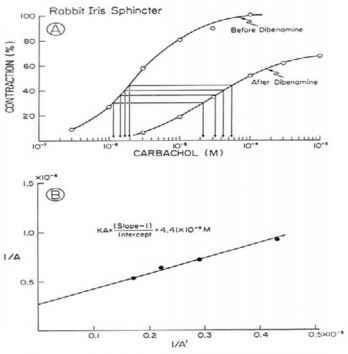 Effect of carbachol on the rabbit iris sphincter before and after dibenamine, an irreversible antagonist. (A) Dibenamine produced a shift to the right and reduced the maximum of the carbachol concentration-response curve. (B) A plot of the reciprocals of the concentrations of agonist that produced the same response before (A) and after (A') irreversible antagonism yields a straight line. Parameters of this line are used to calculate the KD of carbachol for interaction with the iris sphincter muscle. Graph from Akesson et al. with the permission from Springer Verlag. Another approach that has been used to evaluate agonist activity is the operational model developed by Black and Leff . This model is based on an analysis of the relationship between the concentration of agonist and the effect produced. The shape of the curve describing this relationship is usually a rectangular hyperbola, which converts to a sigmoidal curve when the log of the agonist concentration is plotted against the effect. The generation of the agonist-induced effect involves two major steps. The agonist must first interact with the receptor to form an agonist-receptor complex (AR), which follows the law of mass action. The Kd for this reaction is the concentration of agonist which occupies 50% of the receptors, and maximum concentration of the complex occurs when all the receptors are occupied by the agonist.